A bull-tin dedicated to deciphering ancient scripts, cracking codes, solving puzzles, demystifying mysteries, unraveling revelations, unriddling riddles, debunking bunkum, blasting bombast, and abolishing bosh. The search for the origins of the alphabet is a perennial quest. In the fifth century before the current era (B.C.E. ), the Greek historian Herodotos inquired into this matter and heard that at some time in the past a certain Kadmos had come to Boeotia, in Greece, with a group of Phoenicians (that is to say, Semites or Canaanites). Among other things, Kadmos had introduced the art of writing, which had previously been unknown to the Greeks, or so Herodotos thought. The characters of this new writing system were therefore called Kadmean letters or Phoenician letters. Herodotos was not able to say who had originally invented them, but others after him echoed the plausible claim that the Grecian alphabet had its source in the orient. The name Kadmos is reminiscent of Hebrew qedem, meaning "the east", as in "the wisdom of all the sons of qedem (easterners)", which was judged to be inferior to that of King Solomon (1 Kings 4:30). Somewhere in the Levant (the region of Syria, Lebanon, and Palestine) the starting point for the alphabet is to be sought. But where precisely, and when? In the sixth century of the current era (C.E.) an answer was proposed by a Christian writer named Kosmas of Alexandria, who was dubbed Indikopleustes, "Indic seafarer", because he had travelled to India (and even though he had sailed beyond the horizon he rejected Ptolemy's spherical view of the world in favour of the flat earth theory!). Kosmas confidently declared that in Sinai there were inscriptions written in the earliest forms of the letters of the alphabet; these had been taught by God to the Hebrews on their wanderings in the wilderness; subsequently Kadmos of Tyre, a Phoenician, learned these letters from the Israelites and carried them to the Greeks, who in turn passed them on to the whole world. The opinion of Kosmas was that the alphabet was divinely revealed to Moses for the purpose of writing down the laws of Yahweh, the God of Israel. This was also the view of Eupolemos, a second-century Jewish historian. Kosmas was perhaps referring to the picture-writing to be seen in and around the ancient Egyptian turquoise mines of Sinai. These mines are situated north of Jebel Musa, the mountain traditionally identified as the place where Moses received the Torah on tablets of stone, inscribed by the finger of God (Exodus 31:18). This mining area has an abundance of Egyptian hieroglyphic inscriptions, glorifying the pharaohs who had sent expeditions to Sinai, to obtain copper and turquoise. There are also some pictographic texts, which are not decipherable as Egyptian, as the British archaeologist W.M. Flinders Petrie noted when he discovered them in 1905. Actually these pictographic inscriptions had never really been lost, as pilgrims to the Holy Land had long been visiting the mountain of Moses and the mines of Sinai. However, no visitor who saw the inscriptions would have been able to read them, and that includes the peregrinating scholar Kosmas and the polymathic professor Petrie. These chiseled messages have been there for at least three and a half millennia, apparently dating from around 1500 B.C.E. Nevertheless, in his book Researches in Sinai (1906), Flinders Petrie made some significant points about this mysterious form of picture-writing. Firstly, many of the signs clearly corresponded to Egyptian hieroglyphs (so they may have been borrowed from the Egyptian hieroglyphic inventory). Secondly, the limited number of characters in the script probably indicated that it was alphabetic (one sound per sign), not syllabic or logographic (one syllable or one word per sign, and thus requiring many more characters than an alphabet, as is the case with Babylonian cuneiform and Chinese writing). Thirdly, it was presumably representing the Semitic language of the Asiatic workers who are mentioned in the hieroglyphic inscriptions as having participated in the turquoise expeditions. Petrie was right on all three counts, it now appears, but he was not willing to find the original alphabet in this script. He had his own views on the genesis of the alphabet, as deriving from a widespread collection of "geometric marks", abstract signs that had been used from time immemorial. In his opinion, the Sinai pictographic script was simply a "local barbarism". Petrie's compatriot and fellow-Egyptologist Alan Gardiner took a different approach. While working with T.E. Peet on an edition of the Egyptian hieroglyphic texts from Sinai, Gardiner was obliged to consider the anomalous pictographic inscriptions from the same region. Working on the hypothesis that this was a Semitic alphabet, and with the Hebrew-Phoenician names of the letters in mind (aleph "ox", bayt "house", and so on), he was immediately struck by the presence of an ox-head. He boldly suggested to Peet that this was surely an aleph, the sign that represents a glottal stop. The ox-head was also an Egyptian hieroglyph, and when Gardiner subsequently found the "house" hieroglyph (pr) he assumed it was B (bayt). Continuing his search, and applying the acrophonic principle (whereby the initial consonant of the Semitic word associated with each pictograph supplied the sound of the particular sign), Gardiner recognized the "water" hieroglyph (a horizontal wavy line) as M (mayim "water"), the human head as R (rosh), the human eye as the guttural consonant `ayin ("eye"), the cross as T (taw "mark, signature"), the cobra as N (nakhash "snake"). Gardiner then looked for "some recurrent group of signs which might spell some word", and one series of four letters "stood out with great prominence", occurring in six out of the inscriptions he was examining. This turned out to be B`LT, "Baalat" or "Lady" (feminine of Baal, "Lord"), the Semitic appellation by which the Egyptian goddess Hat-hor was known in Byblos and other Canaanite kingdoms. Significantly, hundreds of the Egyptian inscriptions mention "Hat-hor, Lady of the Turquoise", as the divine patroness of the expeditions. This discovery stands as the foundation stone of proto-alphabetic research (but when Gardiner presented his results to the British Association for the Advancement of Science, in 1915, Flinders Petrie politely demurred). 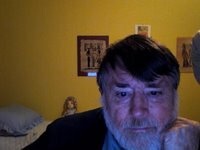 Notice that Gardiner was here practising the technique of "sequencing", a method also employed by geneticists: the investigator scans a chain of "letters" (whether DNA or ABC) and picks out recognizable "sequences". Another feature for comparison is the standard three-letter codon (three nucleotides constituting a genetic code unit determining amino-acid sequence): in Semitic languages (such as Arabic, Phoenician, Hebrew, Babylonian, and Ethiopic) words are built on tri-consonantal "roots". The proto-alphabet came to birth in a world which already had a number of sophisticated writing systems. The oldest of these was the cuneiform script of Mesopotamia (ancient Iraq), the land of the Tigris and Euphrates rivers. This began, naturally enough, as picture writing (pictographs representing words or ideas) some five thousand years ago, towards the end of the fourth millennium B.C.E. The pictographs, usually inscribed on clay, soon moved beyond this stage in two ways: they became stylized clusters of wedge-shaped marks (cuneiform characters), and, by the rebus principle, they became syllable signs, so that dug "pot" was also used for the syllable dug, and so on. This system was complicated, having hundreds of signs, but its virtue was that vowels were represented in its syllabic characters. In Egypt also, a pictographic script appeared sometime before 3000 B.C.E. The earliest-known "hieroglyphs" were pictures representing words, but they then advanced to a phonetic stage. However, unlike the Mesopotamian cuneiform script, vowels were not indicated, only consonants: the sign for pr "house" (the ultimate source of our letter B) could also say pr "go" and be an element in prt "winter". At Gubla (later called Byblos by the Greeks), on the coast of ancient Lebanon (Phoenicia), before 2000 B.C.E., someone produced a new Semitic script, which combined features of the Egyptian and Mesopotamian systems, and needed far fewer signs. It was a syllabary (like cuneiform) and it employed Egyptian hieroglyphs, as far as possible. Its new feature was the principle of acrophony, whereby the first syllable of the West Semitic (Canaanite) word for the depicted object was what the hieroglyph said: thus the pr ("house") sign became ba, the first syllable of Semitic bayt "house". Some examples of the seventy or so characters from Byblos are given on the left side of the PHOENICIA column on the table of signs. Not many documents have survived in this script, and it is widely asserted that it has not not been deciphered yet. I beg to differ. See CANAANITE SYLLABARY and WEST SEMITIC LOGO-SYLLABARY. Subsequently, perhaps at Byblos, but presumably somewhere in the West Semitic area (Syria, Lebanon, or Palestine), the acrophonic principle was applied further, so as to reduce the number of signs to about two dozen: only the initial consonant of bayt was represented by the sign for "house", and this became proto-alphabetic B. The earliest known instances of this new script date from the Middle Bronze Age, before 1600 B.C.E. Actually there is a consonantal alphabet hiding in the Egyptian system: its hieroglyphs can represent three consonants at once (nfr "good"), two consonants (pr "house"), or simply one (r "mouth"). (Incidentally, these three characters are also found in the proto-alphabet, as T., B, and P.) The uniconsonantal hieroglyphs could have been used in combinations to write any ancient Egyptian word, but the Egyptian scribes did not take the step of using only the single-consonant signs and discarding all the others, though modern-day "scribes" in the streets of Cairo will now write people's names with this "pseudo-alphabet", as a tourist gimmick. Whether the inventor of the Semitic alphabet noticed this fact or not, the proto-alphabet was certainly designed as a simplification of all the systems that came before it. Around the fourteenth century B.C.E., a cuneiform alphabet was devised for writing West Semitic language on clay, but after a few hundred years this was ousted by the Phoenician linear alphabet (the stylized version of the proto-alphabet, in which the original pictures are no longer discernible). Out in the Mediterranean sea, on Crete and Cyprus, there were syllabic scripts (notably Linear A, which developed into Linear B in Crete and Greece, and into Linear C on Cyprus, both used for writing Greek language), apparently based on the model of the West Semitic acrophonic logo-syllabary; but these eventually gave way to the Greek alphabet, that is, the consonantal Phoenician alphabet with the added bonus of vowels. 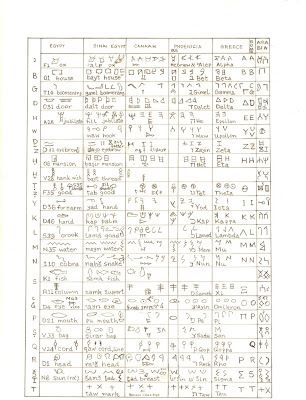 Here is my table of the development of the alphabet, starting in column 1 with Egyptian hieroglyphs that were borrowed for the letters of the proto-alphabet (not in all cases, notice, as W and T have no clear counterparts in the Egyptian system). The second and third columns show examples of the original letters, as attested in Bronze Age inscriptions from Egypt, Sinai, and Canaan (Syria-Palestine). The narrow column (BS = Byblos syllabary) has the syllabic signs corresponding to the subsequent letters of the alphabet. The Canaan column also has examples from the Iron Age (after 1200 BCE), on the right side of each box; and the signs of the Canaanite cuneiform alphabet (with wedge-clusters representing the original pictorial characters) are also displayed in the Canaan panels. The Phoenicia and Greece sections display the names and forms of the letters in the Phoenician alphabet and their counterparts in the Grecian alphabet; the standard Greek and Roman forms appear on the right. The last column displays examples of Arabian letters from the Iron Age, obviously based on the pictorial characters of the Bronze Age, and not derived from the Phoenician alphabet. Click on this chart to see it enlarged. For a detailed study of each letter, go to ALPHABET AND HIEROGLYPHS.